My list reflects my onboard interviews with fellow passengers. I selected the Paul Gauguin to illustrate what it's like aboard a romantic cruise ship because many consider it to be the world's finest for romantic cruising. To most seasoned travelers, the French Polynesian islands are the most romantic on earth. 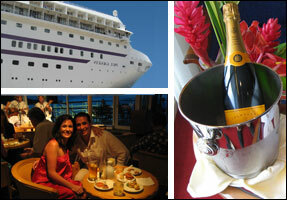 They are the tropical paradise in our dreams - and make the perfect romantic cruise destination. Lushly draped rugged peaks descend into turquoise tropical lagoons rimmed by coral reefs. The islanders are warm, gentle and hospitable - and their dancers are sensuous. Why be in a crowded or cramped environment during a honeymoon or anniversary getaway? The Paul Gauguin doesn't feel that way because it accommodates only 330 passengers (similar-sized ships typically carry 500 or more). Most Paul Gauguin cabins have private balconies. These verandas are ideal for intimate chats, cocktails, and moonlight dinners-for-two. Your table won't be "kissing" the next table.